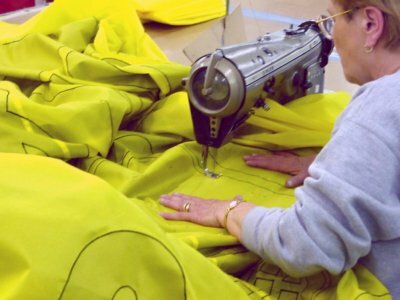 We manufacture custom nylon sewn & appliquéd flags and banners of the finest quality in a wide range of sizes, shapes and constructions. Their quality appearance is enhanced by the dimensional appearance of the appliqué technique. 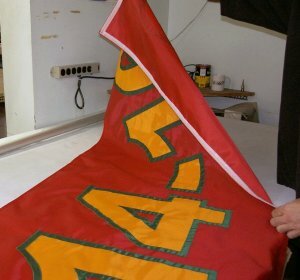 Custom-made nylon sewn & appliquéd flag and banner pricing is determined by size, the number of letters, and whether made single-side, single-reverse, or double-side. (in addition to lettering), and options selected. Single: Single-ply material with lettering and/or design appearing only on the face of the flag or banner. 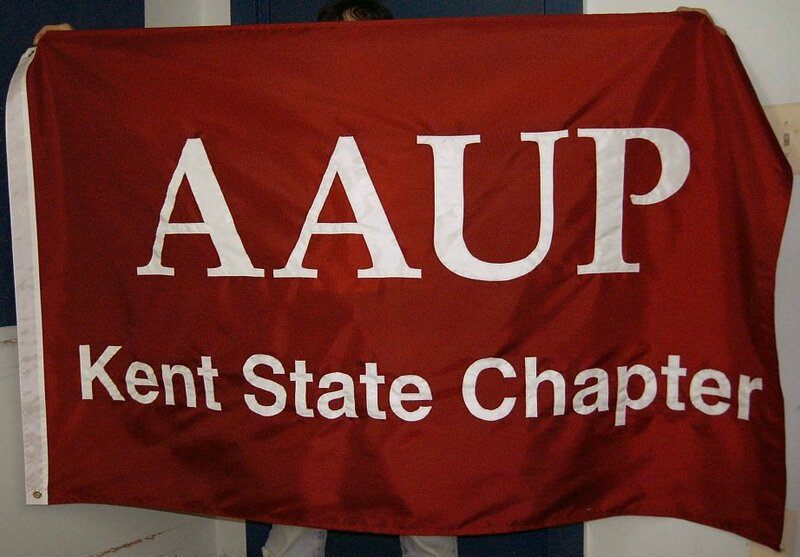 Double: Two single-ply material flags or banners sewn together back-to-back. All lettering and/or design will appear correctly on both sides. Single-Reverse: Singly-ply material with lettering and/or design appearing correctly on the face of the flag or banner. The image on the back side, however, will appear in reverse. Custom Flag shown made with single-reverse construction. 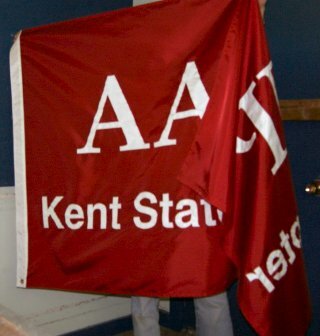 in a lighter weight less expensive custom flag than would double-construction. Pricing for custom nylon flags and banners are determined by category. Block Letters: Sewn & appliquéd block style letters only. Letters may be either upper case or upper and lower case. No designs. One-color background only. Up to two colors allowed for lettering if clearly separated by area or by line. An example of this: Choosing one color for the first line of a banner and a second color for the second or third lines. Simple Designs or Stylized Logo Letters: This sewn & appliquéd category includes most letter styles that do not fit into the block letter category, with or without an additional design. Includes simple one-color designs defined as silhouette-type designs with simple stitching details. It may include up to two colors allowed for lettering if clearly separated by area or by line. Moderate Designs: A maximum of three colors allowed for lettering and designs. Any combination of three colors allowed. Designs with moderate stitching details allowed. Split color backgrounds allowed. Complex Designs: Four or more colors allowed for lettering and designs. Any combination of four colors allowed. Designs with complex stitching details allowed. Sewn and appliquéd or in combination with sublimation images. This is a picture of a custom nylon sewn & appliquéd date panel with Velcro on the backside. It is to be attached to the larger main banner which already has the Velcro mate sewn on. Date panels can be changed throughout the year as needed.